We have already posted some material relevant to 11 November, Remembrance Day, the 99th of that designation. That little collection links to the other posts. There’s also Simon Jenkins from The Guardian, who says ‘enough already’ of Remembrance Day. Two other items came our way from events held on or about Remembrance Day this year; two more items are artefacts of great interest from almost a century ago. In Sydney, long-time peace activist, Hannah Middleton, spoke about what it is that we remember on this day. Are we just going through the motions, touching the easy bases only? On Armistice Day, the flags fly, the solemn music plays, the veterans, the widows and the grandchildren wear the medals and weep, the leaders speak of “fallen heroes”. There are headstones and wreaths and memorials and speeches. They promise “We will remember them”. But we hear nothing about the wounded and maimed, the countless men stricken by shell shock, by post-traumatic stress disorder; the disfigured men who were shunned; the rampant alcoholism and morphine addiction; the terrified kids and battered wives, and the suicides. Perhaps it is easier to remember the fallen with a poppy and a parade than to confront the reality. Perhaps it is politically more expedient. So we must ask on Remembrance Day: what should we remember? Read more of Hannah Middleton’s remarks. Way up in Darwin, there was a service on 12 November for Australian Defence Force Sunday. We were sent a copy of the pew sheet from the service, written by the Very Reverend Dr Keith Joseph, the Dean of Darwin and a former soldier. It is attached and is reproduced by permission. The Dean makes some salient points about the difference between questioning wars and supporting the men and women who serve in them. 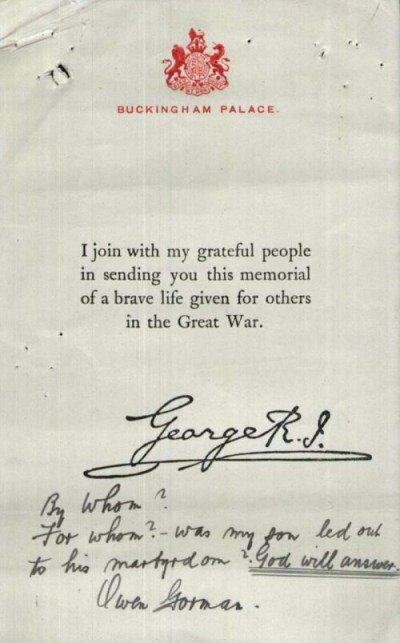 We have often referred in the Honest History enterprise to the King’s Penny or Dead Man’s Penny, sent (with a scroll) by a grateful King George V to bereaved families after World War I. 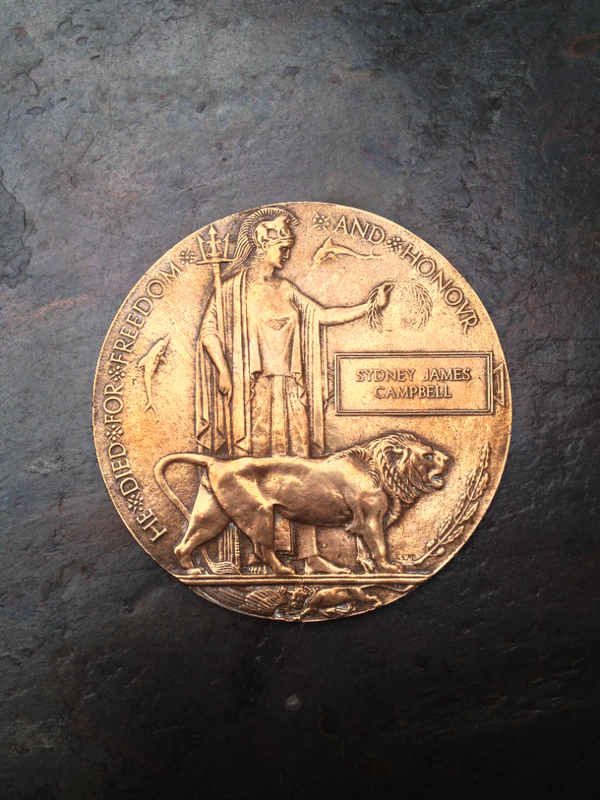 We have one of these medallions in the Honest History office (referring to my great-uncle, Captain SJ Campbell of the 8th Light Horse) and there is a picture of it here. Here also is an annotated scroll, courtesy of an Honest History Twitter follower, ‘Ernest Malley’, who found a picture of it on a website some years ago. The site contained scrolls and medals returned by families. The annotations in this case were made by an unknown family member, an Owen Gorman. They provide a counterpoint to the rhetoric of official commemoration, expressed by the King on behalf of his ‘grateful people’. They also remind us that the ‘freedom’ referred to on the medallion should include the freedom to have views as awkward as those penned by Owen Gorman. As a migrant Dutch historian, now a naturalised Australian, WWI commemorations always pose a problem for me. The Netherlands were neutral during WWI, and so have no memorials of military battles. Yet the Dutch suffered economic hardships, and suffered around 2600 authenticated war casualties (i.e. people in the merchant & fishing fleet and Royal Netherlands Navy, people trying to cross the border into Belgium, and Dutchmen serving in foreign armies, including Australia’s AIF – see https://discoveringanzacs.naa.gov.au/browse/groupstories/7539). As a former citizen of a neutral country, and therefore being able to look at that war with a more detached view, the complete and utter pointlessness of WWI has been one thing that always stuck with me. Millions of people died, not because they were ‘protecting freedom’ or ‘human rights’, but because, essentially, their masters were having a tiff and each brought their own friends along. And so, because I have not lost any family members in WWI, my country was never attacked and because I really do not see the point of what the war was fought over, the grand scale of memorials and commemoration is somewhat lost on me. And like any cultural expression with religious overtones, there are the orthodox symbols and followers, and there are the people that look at the foundations of said religion, why they were laid, what they do, and how we could follow them in deed, not in empty gesture. As such, Hannah Middleton’s comments are quite appropriate, and should accompany a focus of today’s government on not involving Australia in unnecessary wars, and making sure our veterans are cared for.